Boulevard 3 Bedroom Furnished Family Home w/ Fenced Backyard - $4850 — Lynn Swanson At a glance guide to all currently available fully furnished properties managed or represented by Sunstar Realty Ltd.
Pets: dog okay with owner approval. Included items: fully furnished from cutlery to linens; from flat screen TV to designer soap dispensers; fridge, stove, dishwasher, microwave and washer/dryer; and also includes grounds maintenance, cable, and high speed wireless internet. Not included: maid service, gas, electric, move-out clean. LOCATION: Well located 3 bedroom family home, situated in a well established neighborhood in the sunny Grand Boulevard area of North Vancouver. Brooksbank Elementary School and Daycare are one short block walk away. Loutet Park, encompassing several playing fields and playground, is a ½ block walk. Newly renovated Sutherland High School, located 5 blocks walk and Transit is located 2 blocks walking distance. (Buses to Downtown, Seabus, Capilano University and West Vancouver do not require transfers). Retail and grocery shopping available at Park and Tilford Mall, under a 5 minute drive south; retail shopping and Community Centre on Lonsdale Avenue accessible in 5 mins drive (or by bus which has a direct route to Lonsdale along 15th Street). Newly renovated Lynn Valley shopping Mall and Karen Magnussen Wave Pool, Ice Rink and gym a mere 5 minute drive. Grouse Mountain a short 15-20 minute drive North. FEATURES: Charming two level home welcomes you on entry with a comfortable, bright living area with hardwood floors and roaring fire (gas). Turn the corner into the beautiful kitchen with its maple wood cabinetry, stone counters, kitchen island and a great long dining table which can easily accommodate 8-10 people. Second living room adjacent to kitchen makes for a great family space as a place for kids to gather, watch TV, or spread out their toys or homework. Fenced back yard is accessible from family room, where young kids can be easily contained and watched from kitchen/family room area and offers patio space on warm days. Upstairs are three bedrooms (two with queen beds and the 3rd bedroom with double bed), and an updated main bathroom. The good sized mud-room through the side entry is convenient for kids with muddy boots and "stuff". Laundry is also on main floor. 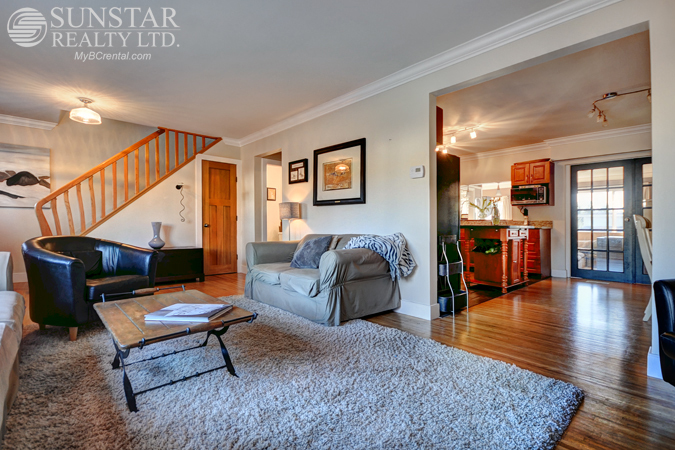 Very central location and no busy streets to cross when walking your kids to school and back. Transit nearby. We do not charge prospective tenants any handling fees, application fees or processing fees. Payments from all major credit cards and direct debit accepted (subject to transaction fees charged by Rentmoola). 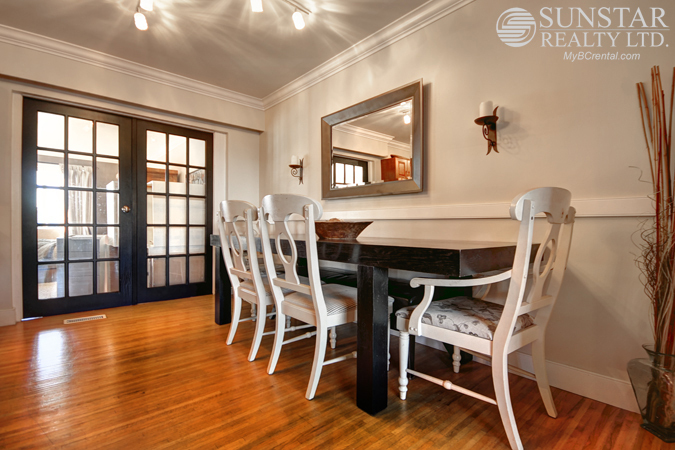 Grand Boulevard Furnished House - Sunstar Realty Ltd.